Using StackOverflow.com, I've always had the impression that its biased towards C#, and .NET in general. That might have been because on the SO tags page C# is number one, with the most questions tagged, or maybe because much of the site itself is built with C# and MVC.NET. So I thought it would be interesting to compare the rankings of the tag popularity on StackOverflow with a leading language popularity index (the TIOBE index). 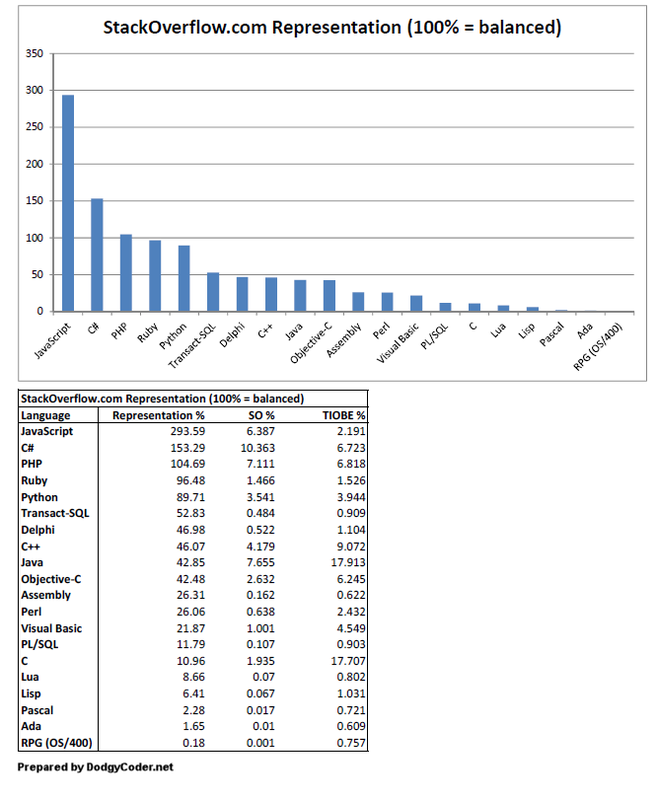 The "Stack Overflow Representation" represents a ratio of the SO tag count (as a percent of total questions) divided by the TIOBE language index percent. Where a representation of 100% means that the SO tag count is aligned exactly with the TIOBE language index. An "over-representation", greater than 100%, might mean there's a greater number of questions on SO than we'd expect. An "under-representation", lower than 100%, might mean there's not as many questions on SO than we'd expect. Stack Overflow data taken from: StackOverflow.com/tags - data snapshot taken at 2:50am UTC, 6-Nov-2011. Total tag count was 2,254,639. PHP ?= Crap! No way, dude. It's awesome. When I develop with C++, I usually don't know what I'm doing. I don't go to stackoverflow.com, because I find it to be a bit stuck-up. I'll go to cplusplus.com, which is friendlier. I think that applies to a lot of novice C++ programmers, hence the under representation. Simon: Are you retarded? PHP is the crappiest of the crap? You are aware that Multi-billion dollar companies have based their entire product on it? "c# is over-represented because it is a crap language!" Insanemal, why are you being rude and talking about violence because someone disagrees with you about a programming language? While PHP is extremely popular, and used by extremely large companies like Facebook and Zynga, it's a relatively inferior language. Its type coersion is terrible, the concepts it melds are relatively non-contiguous, the associativity of its ternary operator is backwards, and its runtime performance is abysmal to the point Facebook wrote a PHP to C++ compiler in order to improve he performance. PHP is the epitome of the "worse is better" aesthetic. Please don't try to twist that into an argument that it's in some way good simply because of its popularity. To do so falls into the logically fallacious realm of argument ad populum. 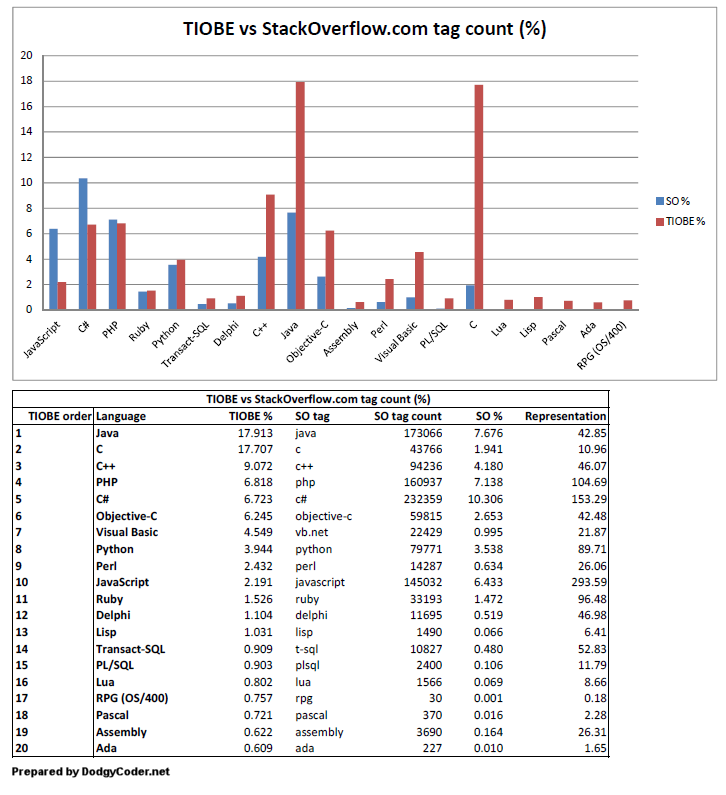 "The only surprise for me is why PHP isn't featured more highly on SO, since (i) it's the crappiest of the crap"
Because there is no strong correlation between crap languages and over-representation of a language on SO? You can base multi-billion dollar companies on crap languages. It doesn't mean the language isn't crap, just that they've learned to work effectively within the limitations. Ratios over 100% are possibly overemphasized in your first graph since ratios under 100% are sandwiched between 0% and 100%. So, without any real evidence... Lua must be the least difficult language. According to your logic, Visual Basic should be the number one represented language. The reason FORTRAN is not included is that Real Programmers don't ask questions on SO, they consult the JCL manual. The amount of questions correlates with the lack of contemporary and sufficient documentation. C for example is more than established and well-known. Hence many jobs, but fewer open questions. There is some question bias, because some languages are more popular and precious to spare time developers, like anything not Java. There should be some way of collapsing those types of questions to reduce the total number of questions. Given that the TIOBE index is garbage, I think judging the ratio of real projects on a public open source repo by it is completely backwards. You might better ask the question: based on the GitHub distribution, where is the TIOBE index totally out of whack? Or you could concede that they are likely both not representative of anything general and thus comparing them tells you nothing. Looks like you missed R. With over 7600 tagged questions on stackoveflow.com, it should be ahead of Lua and after C.
@Ariel F - yes, but this current data was only looking at the top 20 TIOBE index languages, and on TIOBE, R didn't feature in its top 20. I agree with Alex. The TIOBE index's methodology is garbage. There's no evidence it has any relationship to the real world number of programmers. What your numbers show is not SO's programming bias, but simply that SO's ratios are different from TIOBE's. There's no anchor to the real world here. One cannot say who is over nor under representing. It's still interesting data, but there's nothing to support the conclusion. Throw in some more cross-language sites like Github and the scattering of language use would be interesting to look at, but without an anchor to reality there's no way to judge who is biased. My punt at explaining your findings: I would hazard a guess that SO over representation is inversely correlated with quantity and quality of (official) documentation. I'd also be a little wary that you don't do anything with framework tags. There are many frameworks which imply a language, and SO only allows five. @willr, interesting theory ... goes some way to explain why well established languages like RPG, COBOL, FORTRAN, C, etc. don't feature much on StackOverflow, given the significant number of developers using them. Could also be that these devs tend to be older and maybe just don't head straight online for a solution to their problem as many younger devs do? PHP, as a language, is crap even though large companies are using it. People working with PHP in large companies agree on this too. @Lars, hehe - unfortunately you could say the same about things like COBOL and VB - they're not pretty, but they get the job done and they have carved out a niche for themselves in certain classes of applications. PHP was several flaws, but, was there, where other languages weren't. And I wish there where other languages, because there are so many websites done in PHP, that are very difficult to maintain, today (even if got paid) !!! I have about a dozen Java technology related forums in my bookmark list, ranging from JavaRanch to the JBoss and Spring sites. The fact that SO is lacking in Java is no shock. Java had a number of solid forums before SO. And I wouldn't be surprised if there were many C programmers on usenet or on mailing lists. When I was writing C about 15 years ago, Usenet and email lists were the best ways to get help. I wonder if that is the same now. Did you consider posts tagged with .NET (but not a language tag)? Of course, the majority of questions on SO are about libraries (often 3rd-party libraries) and tools, regardless of language tags. A lot of questions tagged C# should really be tagged .NET since they are questions about libraries or tools that any .NET language can use. The measure of "over-representation" is certainly a combination of many things but I suspect the two primary things it is measuring are language growth of fresh developers (rather than growth of usage of the language which TIOBE measures) and also the lack of other sources of really good online documentation. So what if they ask more questions ? Does that make them any less programmers ? I bet you never posted a single question about your language. Isn't what the web is for ? Making information more accessible , you tend to forget that sometimes even a great developer often need others opinions or advice . And to correct you , .Net or more specifically c# is one of the best generak purpose languqge and if you can use msdn efficiently you'll find your name less online. I believe that regardless of anything. A great developer will write a good program using any language. Perhaps if you spent more time developing software than trying to engage in language politics you'd be great too. A multi-billion company doesn't have to use the best tools to make a lot of dough. Just ask anyone on Wall Street or currently unemployed person. Sure Facebook uses PHP, but is facebook rock solid, stable enough to run a power plant? Yeah, I thought so. @Qwertie, the language from TIOBE was just matched with the nearest tag on StackOverflow. I only used one tag per language, and didn't want to get into the complexity of (C# + .NET - VB.NET), etc.